As the rest of the supporters do, I appreciate his effort and how he tries to fight every single ball, but he is really really bad. The club has not announced it (edit: the club announced it at 9:23 am today), but Manucho certainly has - on his Instagram. The Angolan striker is almost certainly back at Rayo, for a fourth season. Manucho: The lion "comes back home"
This is not necessarily a bad "signing" - Javi Guerra's start to the season hasn't been great, and Raúl de Tomás, for all his qualities, doesn't seem to last 90 minutes week in week out. It's easy to be harsh on him, but he actually played quite well last season. He scored goals to kill off games, he kept defenders busy, and he gave Rayo an option in the air. And all that as a "super-sub". 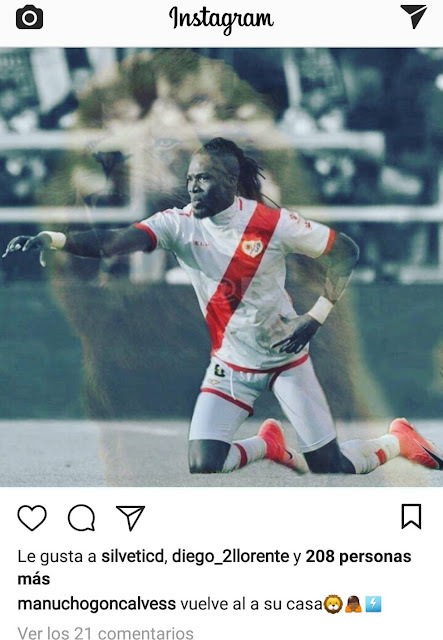 For me, there was something quite symbolic about Manucho "leaving" Rayo this summer. He left everything behind for a trail in Manchester, and he faught - quite admirably - for so long to stay in Europe...if he really did have offers from Asian countries it would have marked the end of an era had he taken them - in the worst possible way. I thought he still had a season left in him. His name first emerged when Sir Alex Ferguson signed him in January 2008, after a three week trial. For less than a million euros, Alex was getting, in his words, a "tall, agile, quick forward". However, the striker who should've competed with Wayne Rooney, Carlos Tévez, and Louis Saha, ended up not even getting a work permit. After six months on loan at Panathinaikos, getting a work permit, getting just three games in the red shirt, and a loan stint at Hull City, it was clear that Manucho didn't belong. Real Valladolid spent 3 million euros on the player in 2009. In an unforgettable press conference, Manucho promised 40 goals that season. And while he gave a 100% of promised effort, he scored a measly 10% of promised goals - the 2010-11 season was spent on loan at Turkish top flight clubs Bucaspor and Manisaspor, and the 2011-12 season was spent largely on the sidelines watching Valladolid go back up to La Liga. The picture above reminds me of Baltasar Gracián: “At 20 a man is a peacock, at 30 a lion, at 40 a camel, at 50 a serpent, at 60 a dog, at 70 an ape, and at 80 nothing”. And, quite eerily, Manucho's breakout season was when he was 30 years old too. It was the 2012-13 season that showed what Manucho was capable of - he scored eight goals in just 1653 minutes of game time, and was Valladolid's second top-scorer. Ever since then, the stats haven't shown something significant. He only scored three goals when Valladolid got relegated again in 2014, and has only scored 14 goals for Rayo in three seasons. He isn't quick by any means anymore, but he brings direct play, a powerful header and a central focal point to the attack. He fights for every ball, he leads by example, he attacks the defense at their weakest. The lion may have aged, but he has definitely come back home.